This slender, delicate wildflower was known as the bluebell in some parts of Scotland, but most people in Britain and Ireland who know their wildflowers call it the Harebell. Campanula rotundifoila is a hairless perennial that copes well with drought and exposure to sun and wind, but as a result its height is very variable and ranges from a mere 15cm to 40cm and occasionally more. The short-lived basal leaves are round and have long stalks; leaves higher on the stems are narrower and stemless, persisting throughout the blooming period. The delicate nodding blue flowers, borne on short slender stalks, are bell shaped with nearly always five fused out-curved petals creating a toothed corolla 12 to 25mm long. Campanula rotundifolia is common and widespread throughout Britain and occurs in many parts of Ireland particularly along the western and northern coasts. This wildlfower is also found in many parts of mainland Europe and in North America. 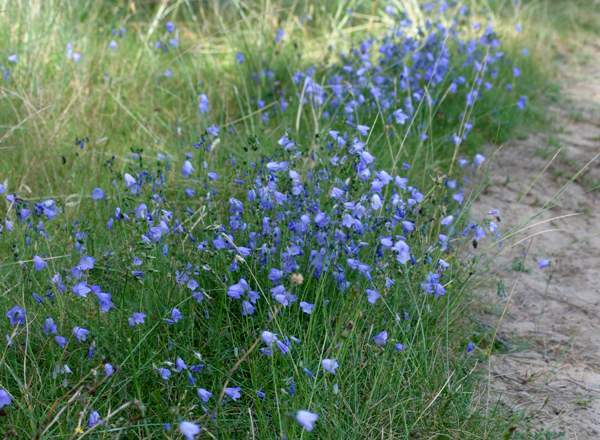 Harebells are found in both acid and alkaline sites, but they favour dry grassy situations such as coastal sand-dune systems and the edges of pine woodland on sandy soils. Harebells grow in great abundance and make spectacular displays on banks, under sparse hedgerows and on well drained slopes in the hills of Britain and Ireland. 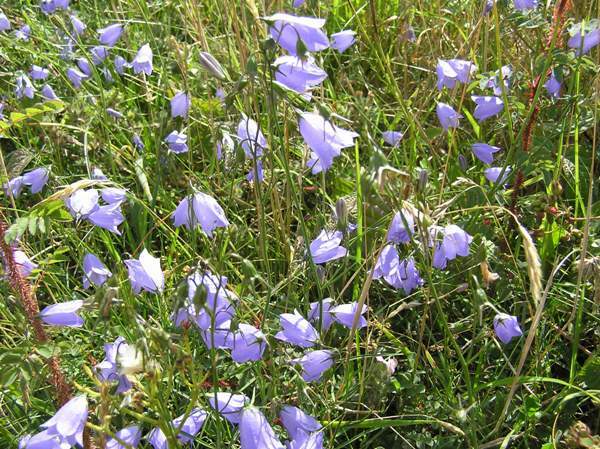 In Britain and Ireland the first Harebells bloom in late June or early July and continue flowering through to the end of October and occasionally, if the weather is not too harsh, well in to November. Although late arrivals, therefore, these pretty little flowers add a welcome splash of colour to the countryside in late summer, just as most other wildflowers are dying back. 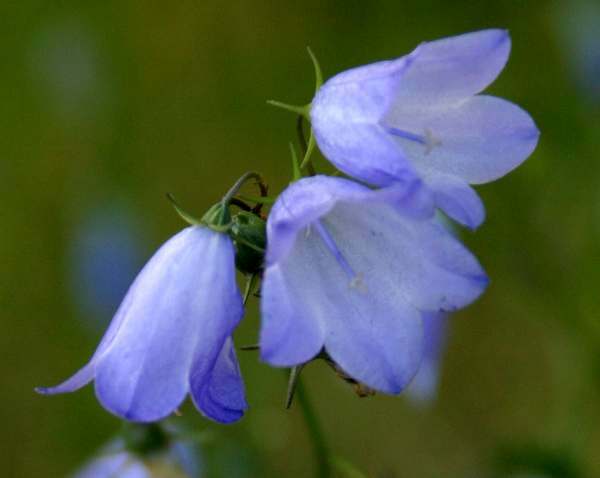 Campanula, the genus name, referes to the campanulate (bell-like) form of the flowers, while the specific epithet rotundifolia means with round (in other words rotund!) leaves. Although it has in the past been used to treat various ailments, there is surprisingly little reference to Harebells as a herbal remedy. Perhaps some flowers really are best enjoyed for their beauty... unless you are a bee, in which case you will not be alone in visiting Harebells.